New Lego Star Wars Announced for March 2014: a Lego AT-AP (75043)! This past weekend at the San Diego Comic-Con (SDCC) Lego announced and revealed a whole lot of new sets. One of which is a new Lego Star Wars AT-AP (75043). 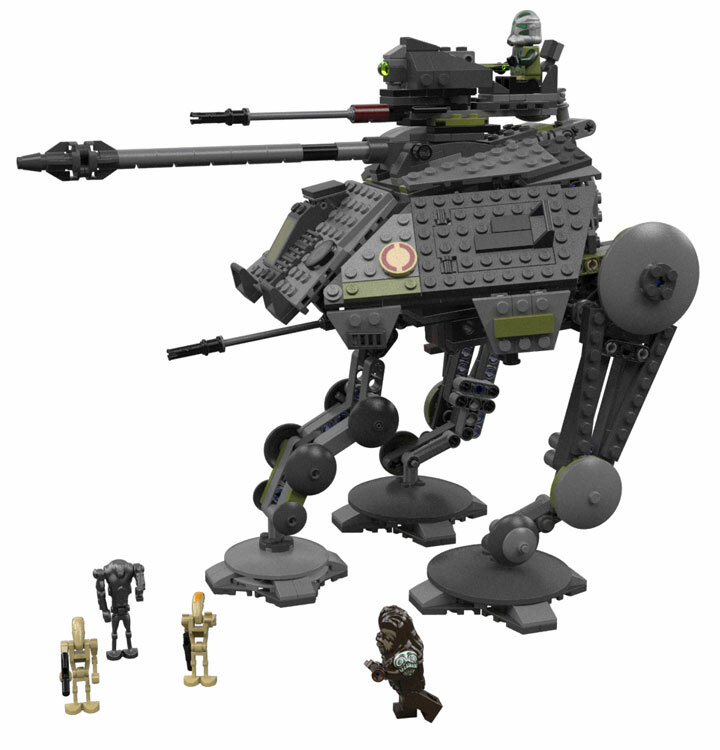 This is a new version of the older Lego Star Wars AT-AP Walker (7671), which has proven to be extremely hard to find. The AT-AP (All Terrain Attack Pod) made its first appearance in Star Wars Episode III: Revenge of the Sith. It looks like this version will feature five minifigures, a Wookie, Clone Trooper, and three Battle Droids. Gone are the bright red and lime green detailing, giving this Lego AT-AP a much more realistic design. Not to mention vastly superior feet and legs. This new Lego AT-AP will include a total of 717 pieces and will priced at $69.99. Due out in March 2014.